In small bowl, mix butter and herbs until blended; set aside. Season chicken with salt and pepper. In 10-inch nonstick skillet, heat oil over medium-high heat until hot. Cook chicken in oil about 5 minutes, turning occasionally, until no longer pink in center. Remove chicken from skillet; set aside and keep warm. To same skillet, add onion; cook about 3 minutes, stirring occasionally, until tender. Remove onion from skillet, set aside. Reduce heat to medium. Spread generous half teaspoon herbed butter on outside of all of 4 bread halves. Place 2 halves in heated skillet, buttered side down. 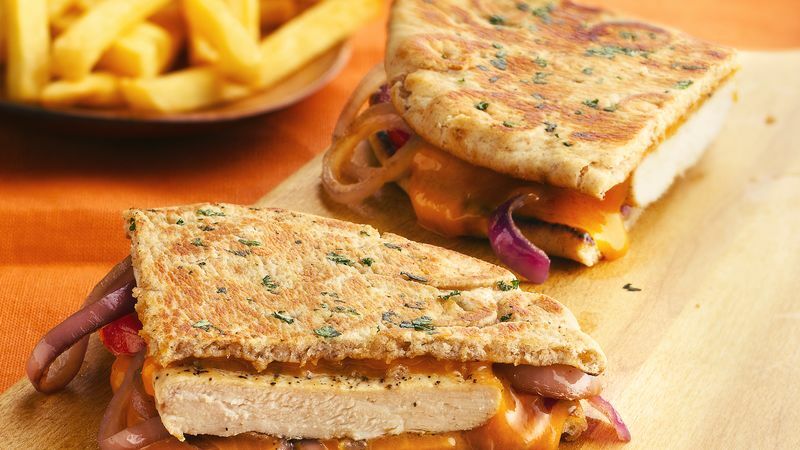 Top each with 1 slice cheese, 1 chicken breast, half of the onion and sliced tomato, and another slice cheese. Top with remaining pita bread halves. Cook about 2 minutes, pressing down with spatula, until bottom is golden brown. Turn; cook about 2 minutes longer, pressing again with spatula, until cheese is melted. To serve, cut each sandwich in half. For easy prep, purchase chicken breasts that have already been pounded (they may be labeled as chicken cutlets). If you don’t have fresh herbs on hand, substitute 1 teaspoon dried herbs.